This October the “Work in Progress Mural” traveled to Milan, Italy to be exhibited in the restaurant of chef and collector Brendan Becht, founder of Zazà Ramen, noodles bar. Brendan exhibits a new contemporary artist every six months, usually commissioning them to create the work directly on the walls of the restaurant. 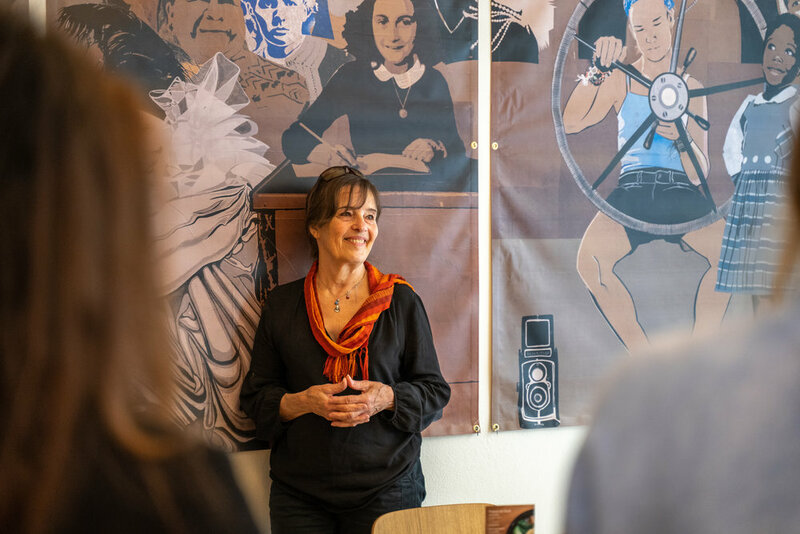 The “Work in Progress Mural” is the concept of Modern West Fine Art (MWFA) represented artist Jann Haworth, who also directs the collaborative project. The stencil portraits are made by participants in workshops run by Jann Haworth and Liberty Blake, most are created by self confessed ‘non-artists’. The final panels are collaged together by artist Liberty Blake, also represented by MWFA. Brendan Becht is the son of Fritz and Agnes Becht who established one of the most prestigious modern collections in the Netherlands, and were listed in the ‘Top 200 collectors’ in ARTNEWS for five consecutive years. The Becht’s bought two of Haworth’s pieces, “Charm Bracelet” and “Betjeman Bear” in the early 60’s when she was based in London and represented by legendary art dealer, Robert Fraser. Gallery owner, Diane Stewart and Jann Haworth travelled to Milan for the opening dinner, and media launch, where the mural was extremely well received. The following article (translated from its original Italian) was written by Caterina Angelucci for ArtsLife. Photographs were taken by Stefano Mascolo and are reproduced courtesy of Zazà Ramen. ‘Anthelme Brillat-Savarin, a French politician and gourmet, the same age as Robespierre, said that inviting someone for lunch meant taking charge of this person's happiness during the hours he spent under their roof. It may be trivial, and perhaps a bit, and yet the aphorism seems to coincide with the idea that I made to meet Brendan Becht, founder of Zazà Ramen, noodles bar in Via Solferino 48 in Milan. Brendan is a collector chef, and every six months on the premises of his restaurant, he offers exhibitions by contemporary artists. From 17 October 2018 to 24 March 2019 the walls of Zazà Ramen will host Women's History Mural (Work in Progress project), a project by Jann Haworth and her daughter Liberty Blake. The two surnames, Haworth and Blake, were linked 50 years ago by an artistic association: In 1967 Jann and Peter Blake, Liberty’s father, created the Beatles iconic cover for Sgt. Pepper's Lonely Hearts Club Band, the biggest album of all time. At the base of the genesis of the Women's History Mural there is the same collage technique that has so characterized Sgt. Pepper but from the ideological point of view the new mural work clearly distances itself: Jann tells that the figures the Beatles chose for the cover consisted of more men than women, and those women were pin-ups or mannequins. Today, this is no longer acceptable, and for this reason Jann decided to create a mural with the faces of women who have distinguished themselves in history, science, politics and art, becoming icons of the era to which they belonged. During the opening dinner at Zazà, the enthusiastic energy of the artist was accompanied by the background noise from the kitchen and aromas of oriental flavors. The six panels on display - in the complete work are more than double, with a total of 250 female faces - present colors that cross the various ranges of brown, gray and bordeaux with some interruptions of electric blue, perfectly accompanying the style of the room. It seems custom designed but actually is pure chance, jokes Brendan Becht while welcoming his guests. Under the eyes of Marie Curie, Tracy Chapman, Anne Frank and Jane Austen we sit at the table with Jann and Brendan, while hot portions of ramen arrive. The chef comes from a family of Dutch collectors who in 1965, in London, knew Haworth through the gallerist Robert Fraser, also a friend of the Beatles and the Rolling Stones. In 2016 the two got back in contact and the invitation to exhibit in Italy came soon after. 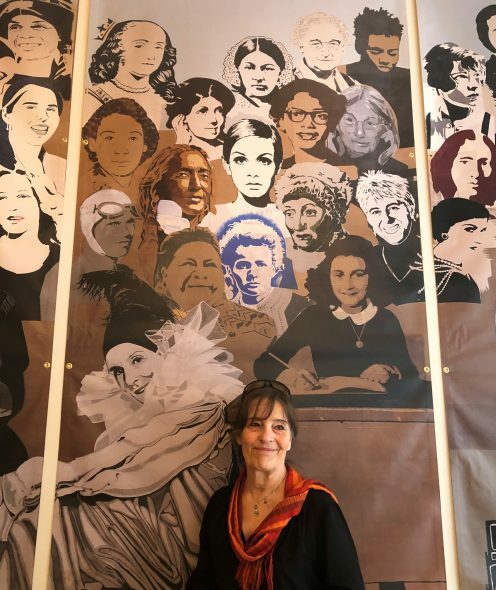 Women's History Mural is a project in progress: presented for the first time in 2016 at the Utah Museum of Contemporary Art, in Salt Lake, it grows from exhibition to exhibition. In fact, the two artists invite participants to suggest the women they would like to see represented, creating a collective and collaborative project. For now, only one Italian woman is present and it is Maria Montessori but Jann immediately announces that many more will be added. 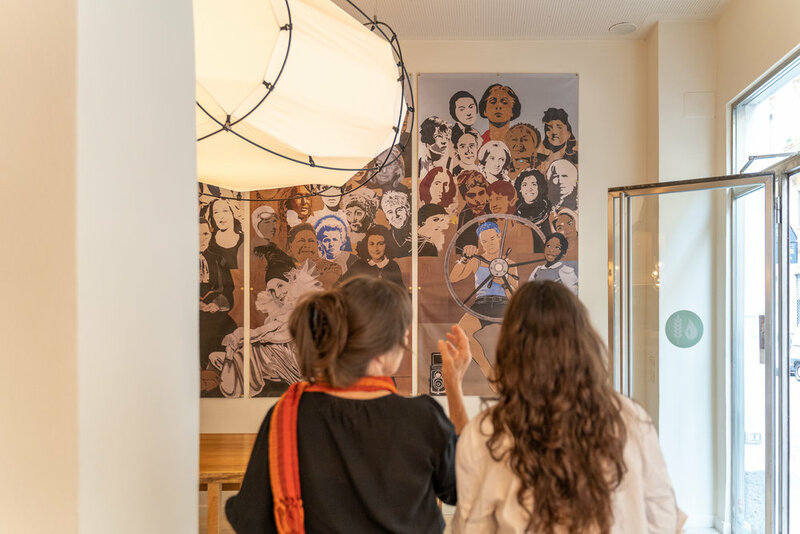 A traveling work with a strong ideological connotation, Women's History Mural can be seen at the Leonardo Museum's Woman/Women Exhibit in Salt Lake City.